The final result is an attractive, multisport facility for an active student population, photos speak for themselves! Pascoe Vale Primary School, in Melbourne’s Northern suburbs provides quality programs for a growing student population of more than 550 students. Their school yard could only be described as unplayable and an irrigation system previously installed to manage the natural oval had been unsuccessful. 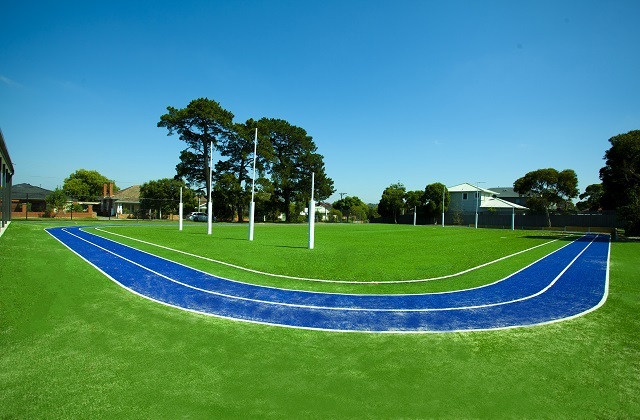 The school is now equipped with a new Grassports Australia multisport oval, incorporating long jump pit and recreational play area with two vibrant multicolour hopscotch and a large snake featuring 20 multi-coloured squares. With 2295m2 of Australian made long-pile synthetic grass, crushed rock base construction and a combination of crumbed rubber and sand infill, the oval incorporates white markers for rounders, a cricket centre wicket and surrounding blue running track. Works were completed with landscaping of nearby garden beds and installation of removable AFL goals with safety padding.